Apple has released the new iOS 10 with lots of new and improved features. One of the biggest and improved changed is the New Siri. The popular voice assistant is not only more predictive and responsive, but can also more swiftly assist you in several tasks. We take a look at the top 3 new features Siri has benefited from in iOS 10. This is a handy little feature that is a welcome addition especially when one is driving. 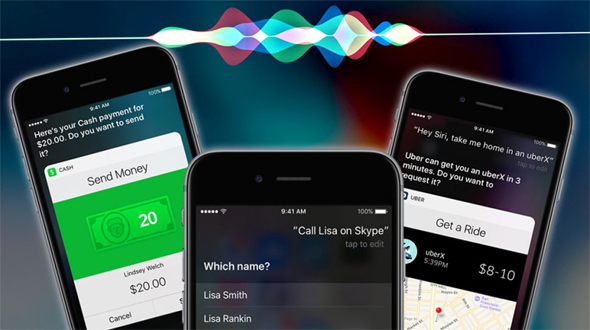 Siri is now equipped to announce not only the name, but also the number of the incoming call. Go to Settings > Phone > Call > Announce Calls. Choose any of the options: whether you want Siri to announce the calls when connected to CarPlay and when the earphones are on, or when the headphones are on, or if you never/always want Siri to announce the incoming call. Booking a ride on Lyft or Uber now gets simpler thanks to Siri. You don't even need to access the ride-hailing apps! Simply instruct Siri to "Book me an Uber" or "Order a Lyft." If you ask Siri to book an Uber, it will follow up and ask you which category you prefer, UberGo or UberX. Once you make your preference clear, Siri detects your location and alerts you of the nearest available cab as well as the estimated fare to your destination. You can then confirm the booking request or cancel it. Just ensure that the Uber or Lyft app is updated to the latest version that supports iOS 10! This feature is also pretty handy, especially if you find it annoying to sift through realms and realms of images in your photo gallery just to locate a particular snapshot. Siri now makes life easier and is able to search for a picture from a particular date on iOS 10. For example, if you want Siri to seek out a picture taken on your birthday in March, simply issue the voice command "Show me photos from March 11." It really is that easy! No more scrolling through a massive library! That's not all. You can even instruct Siri to look up images from "last week" or "yesterday" or even "last month." You can even issue commands to find videos in your photo library. We know we said top 3 features, but here's a bonus one! So if you have downloaded the new iOS on your iPhone, enjoy the experience of the new OS and let us know your experience with new Siri in the comment section below and if you have not then get it right now it’s must have update.